The opening of the new BAPS Shri Swaminarayan Mandir in Lisbon, Portugal was celebrated on the weekend of 27 and 28 September 2014 in the presence of sadgurus Pujya Keshavjivan Swami (Mahant Swami) and Pujya Bhaktipriya Swami (Kothari Swami) as well as visiting sadhus from India and England. The mandir marks the growth of Satsang activities in Lisbon which accelerated after Pujya Swayamprakash Swami (Doctor Swami) and four other sadhus visited the city in 1982. His Holiness Pramukh Swami Maharaj visited Portugal in 1984 and 1988 inspiring further growth and development. During his visit again in 2000, Swamishri met with the then President of Portugal, Jorge Sampaio, and blessed the people of Lisbon that a large Hindu mandir would be built here in the future. The long-awaited opening of the Mandir is the fruition of tireless efforts by Swamishri, sadhus and volunteers over decades. The two-day ‘Mandir Mahotsav’ festival began on Saturday 27 September with an enlightening cultural programme presented by the Women’s Forum. Women of all ages performed folk dances and dramas and delivered inspiring speeches emphasising the religious significance of a mandir and its role in fostering social harmony and holistic well-being. In the afternoon, the murtis to be consecrated in the Mandir travelled through the heart of the city in a colourful Nagar Yatra to bless the city and inhabitants of the deities’ new home. Thousands came out on to the streets to enjoy the procession of beautifully decorated floats, traditional dances and the sounds of joyous music. 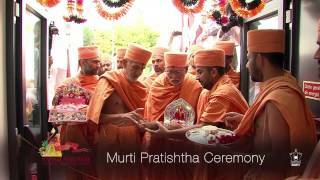 The murti pratishtha rituals for the Mandir had been performed by Pramukh Swami Maharaj in Sarangpur, India on 24 April 2014. On the morning of Sunday 28 September, these murtis were ceremonially consecrated in their respective shrines by Mahant Swami and Kothari Swami amid Vedic chanting and rituals. The inauguration celebrations of the new mandir included a special mahapuja during the morning where devotees and well-wishers offered their prayers for peace and well-being to prevail throughout the local community. The first arti of the new mandir was joyously performed thereafter. In the evening, a special dedication assembly was held in central Lisbon where chief guest Dr Jitendra Nath Misra, Indian Ambassador to Portugal, as well as local councillors joined hundreds of well-wishers and devotees. Dr Misra paid tribute to Pramukh Swami Maharaj and the efforts of all the volunteers for gifting the people of Lisbon with such an inspiring and beautiful place of worship. The new mandir will serve as the hub of spiritual, community and charity services for BAPS Swaminarayan Sanstha in Lisbon and Portugal more widely.